What began back in 1993 as a simple “favor” of helping friends and colleagues with their minor facility service needs, some weekend project work such as changing a light bulb “here or there”, or an occasional assignment such as striping a parking lot, has branched into one of upstate South Carolina’s fastest growing facility services organizations. Complete Commercial Solutions grew through word-of-mouth referrals. “I tried to treat people like I would like to be treated and the rest just took care of itself. One project led to another, then another. Each became bigger and better than before”, according to President, Trey MacDonald. 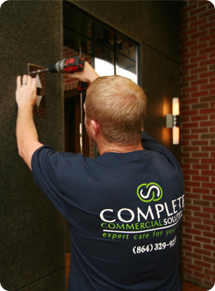 Today, Complete Commercial Solutions specializes in meeting unique needs and challenges of today’s building managers and owners while providing expert care for your facility. Partnerships include a commitment to quality and integrity throughout the business relationship. While the rate of growth has been phenomenal, the partnerships that were established many years ago remain – and are daily growing stronger. In order to maintain market advantage, Complete Commercial Solutions is consistently in “recruitment mode” and knows that it takes a very unique individual to service clients in a manner consistent with our vision and mission.